Many of our closest and deepest ministry involvements at Storrs Congregational connect with issues of hunger, feeding ministries, and advocacy around food justice issues. The church assists local families by maintaining a food pantry which is primarily used to pack and deliver food to Mansfield families four times per year, but may also be accessed on an emergency basis. Food may be dropped off for the pantry at any time. Volunteers check expiration dates and sort the food into storage. Four times per year the food is packed and delivered to Mansfield families. Packing is done on a Saturday morning from 9:30-11:00 and there are jobs for all ages. For example, even young children may carry pasta to the bags set up for each of the families. Others may package fresh produce that has been purchased in bulk. No training is needed. Many hands make light work! Deliveries to local addresses are made by volunteers on the Sunday following packing. Mark your calendar to help with this important service. In conjunction with our food pantry ministry, as well as local food drives conducted by the local Boy Scouts troops and the National Association of Letter Carriers (US Postal Service workers), our congregation carries out a series of four food delivery operations each year. Families identified by the town’s human services offices receive a carefully packed delivery of food items, often combining food pantry type items with fresh produce. At the deliveries conducted adjacent to the Thanksgiving and Christmas holidays, resources for the purchase of a holiday entree (such as a turkey) are also included. Food distributions take place at Thanksgiving-time, Christmas-time, shortly before Easter, and at the end of the K-12 public school year. Storrs Congregational is a major sponsor and organizing partner of the Storrs-UConn Interfaith CROP Walk. 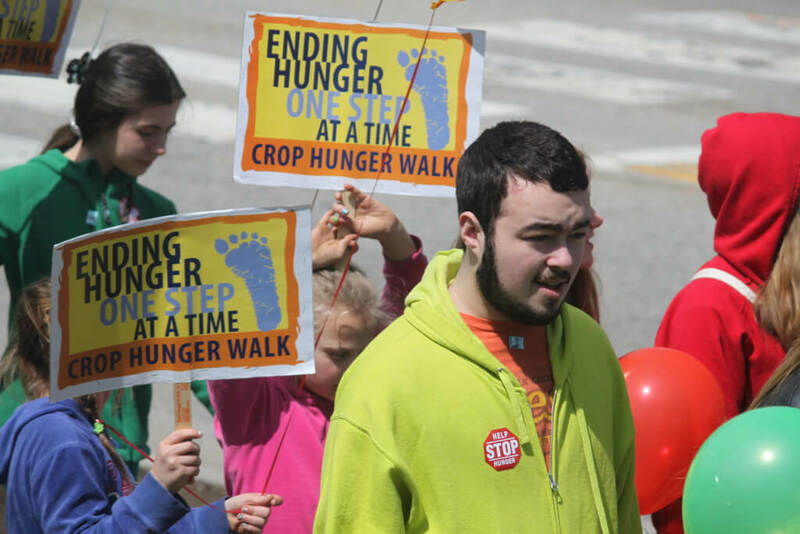 CROP Hunger Walks are community-wide events sponsored by Church World Service and organized by local congregations and groups to raise funds to end hunger at home and around the world. After a multi-year hiatus, members of our congregation worked to resume the Storrs-area walk, with the first in the new series being held in April 2013. Walks are typically scheduled to coincide with “spring weekend” at UConn, a way our community helps contribute to the new tradition of positive engagements for and among students on this weekend. We believe feed hungry people must go hand-in-hand with working to address the systemic causes of hunger and food injustice–social, economic, and political. Deep concern for the ordering of society and common life runs through our faith heritage in both the Hebrew (Old Testament) and Christian (New Testament) scriptures, in the streams of our theological tradition, and in our contemporary witness as progressive Christians in the world today. Recent advocacy efforts have included engagement with the efforts of Bread for the World, as well as through our financial support of FoodShare and our wider ministries through the United Church of Christ. As you’ll see on our Local Mission Parners page, our food-related ministries extend even further through our participation with and support of a number of our local partners, such as the Covenant Soup Kitchen and FoodShare.